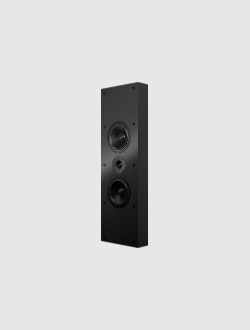 All Custom Series loudspeakers are designed to be used in both on-wall and in-wall installation options. Furthermore using special brackets makes it possible to position the loudspeakers both vertically and horizontally, e.g. for use as a centre channel. 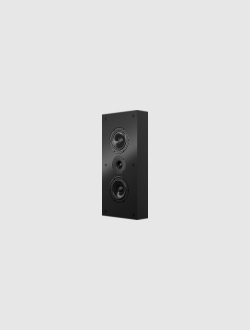 If your wall is hollow internally, for example if it is made from plasterboard, the Custom Series loudspeaker can be installed into the wall using a dedicated metal bracket. This can be acquired as a separate accessory named In-Wall Metal Kit, which is available for all Custom Series models. Besides the metal bracket the kit includes an acoustically transparent textile grill, which covers both the loudspeaker and the metal bracket. These days the TV screen technologies advance faster than ever before, with manufacturers releasing new improved models every six months if not more often. Naturally there comes time when you would like to replace your screen with a new one. Most likely it will come larger and thinner (by the way: the thinner the screen, the less space for the sound it has). It might be so that you already have a sound system, which you are perfectly content with. The change for a bigger TV might make the installation look less aesthetically pleasing. If this is the case, then the Custom Series loudspeakers owner has a unique option to match his loudspeakers to his new screen. We offer two accessories: On-Wall Kit and In-Wall Kit for on-wall and in-wall loudspeaker installations respectively. Both of these kits include a special frame, which is screwed onto a loudspeaker, as well as an acoustically transparent textile grill. Each kit is meant to have specific dimensions to ensure a perfect visual match with your TV screen. Please contact an authorised AUDES reseller to place an order for any of the kits.